Height dimensions are after the Arbour legs have been pushed 12"/30cm into the ground. Colours available are Black, Green, Cream, White, Unpainted Galvanised, Etch Galvanised, Hand Painted Verdigris and Natural Rusted. 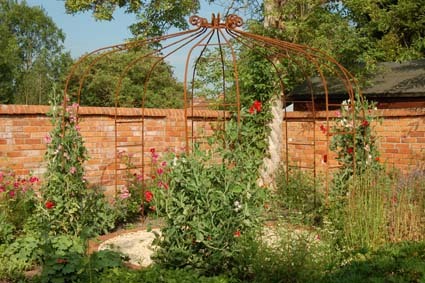 The Camelot Arbour is made up of two Wrought Iron Camelot Arches held together with a "D" ring at their top. 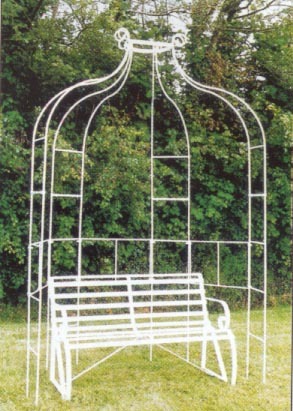 There are Wrought Iron side pieces to give an enclosed effect to the Arbour. There is a delivery charge based on the order value see below or see "How to Order" on Home Page. For details of the galvanised option see below* Cream, White, Etch Galvanised, Unpainted Galvanised. (Cream and White have a Galvanised Undercoat.) Hand Painted Verdigris, with Galvanised Undercoat. The same 10ft diameter Rusted Arbour with 7 Legs as illustrated earlier on the page after several year's growth. See "How to Order" on Home Page. There may be an extra delivery charge for parts of Scotland, parts of Wales, the Isle of Wight, the Outer Isles and Northern Ireland - see note below.There will also be an extra charge for deliveries to Southern Ireland. If you are contacting us from outside the UK please email us with your details so that we can quote you for delivery direct to your home. We arrange delivery throughout the world and we can quickly quote for all destinations. .Please email us at info@wessexforge.co.uk or phone us on 01749 870 250. To order:Phone us with your Credit Card details or Post us a cheque (made out to Wessex Forge) for the full amount to us at Wessex Forge. To order: Phone us with your Credit Card details or post us a cheque (made out to Wessex Forge) for the full amount to us at Wessex Forge.